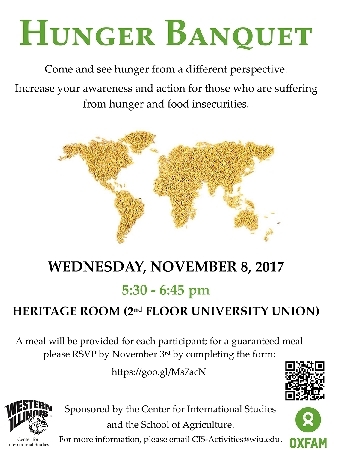 MACOMB, IL — Western Illinois University's Center for International Studies and the School of Agriculture is sponsoring the Oxfam Hunger Banquet from 5:30-6:45 p.m. Wednesday, Nov. 8 in the University Union Heritage Room. Meals will be provided to every participant registered. Reservations are required by Nov. 3 and can be completed by filing out the form at goo.gl/forms/xQEmd2MD0J2pbEJ52. The event is designed to increase awareness and action for those who are suffering from hunger and food insecurities and as part of the commemoration of International Education Month. For more information, email CIS-Activites@wiu.edu.